Perhaps taking a cue from the godfather of Christian rock, Larry Norman, founder and bass player Richard Lynch describe why he created Saint. The year was 1983 and I was a Christian who loved heavy metal music. Finding far too few sounds within the Christian music scene that satisfied me, I decided to create the sound I wanted to her myself,' Lynch writes in the liner notes to their debut EP, Warriors of the Son. So why should the devil have all the good music? Scraping together $1,000 and recording in an eight-track studio, Saint produced Warriors of the Son, a raw platter of American-style NWOBHM. Notable was the (more than obvious) comparison to British metal brethern, Judas Priest, as vocalist Josh Kramer could have been Halford's twin, though I think the former was a bit raspier. Give Saint kudos for moxy, but not so much for originality: Warriors of the Son was as bold as it was rough-hewn and unpolished. This was not unlike other secular and Christian bands seeking an audience through tape trading. It's singular piece, an example, of those great early days of metal. Better than average scores for Saint for taking their best shot with limited resources, and then hitting it big. Call it an exercise in faith. 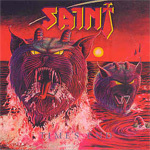 In 1986, Saint was picked up by the edgy Refuge Music Group for their first release on their Pure Metal imprint. Despite the Spinal Tap revolving door of drummers, Saint returned to the studio for Time's End. While production and clarity got a boost, Saint stayed the course for their metal. Call this Warriors of the Son part deux. Apocalyptic and salvation themes flowed in the lyrics, but they were also mixed with sci-fi mythology. Frankly, this is my favorite of the three albums here. It simply has the complete Eighties metal sound which the started from (despite the ongoing comparisons to Priest). Changes were already in the wind for heavy metal in 1988 when Saint returned to the studio for Too Late for Living, the album which Lynch believes is their best. I would say it's their most accessible album having a commercial appeal thanks to the serious rock-in-metal groove flowing through the album. Though not a bad thing, TLFT didn't always seem to have the muscle of its predecessor. Nevertheless, new guitarist Dee Harrington offered some truly soaring fret work, and the production was, once more, bumped up a notch. The reiussue of Saint's first three recordings is certainly rewarding. They offer glimpses into the heady days of early Eighties heavy metal, and the counter-cultural efforts of Christians to engage and contribute to the blossoming scene. Recommended for fans, historians and, simply, lovers of classic heavy metal. The reiussue of Saint's first three recordings is certainly rewarding. They offer glimpses into the heady days of early Eighties heavy metal, and the counter-cultural efforts of Christians to engage and contribute to the blossoming scene.